SAP is one of the world’s biggest software companies – creators of the one of the leading ERP (enterprise resource planning) solutions. This is the kind of software used to run major corporations – and it can handle everything from controlling robots on the factory floor to administering the HR department and fine-tuning the supply chain for precision parts delivery. It’s huge, it’s complex, and it’s not the kind of software bought on a whim. It is, in fact, a major investment and a significant strategic decision, likely to be taken over a number of years, with many people involved, and probably involving a formal bid process. This means winning hearts and minds and generating new business is a long-term operation. I was asked to help with the creation of a range of supporting material designed to promote SAP among a wide range of audiences and explain the many and varied benefits the software can bring. 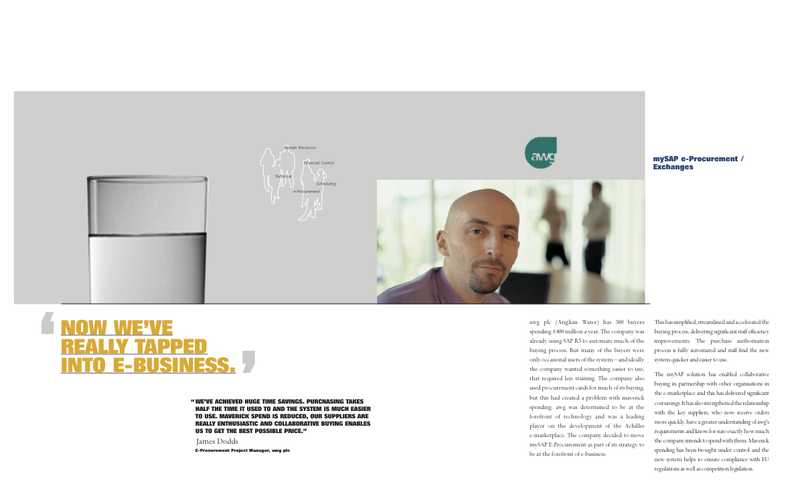 This included writing a major 28-page brochure on e-business capabilities complete with a wide range of case studies. I also worked on a range of direct mail material to be sent out to prospects. 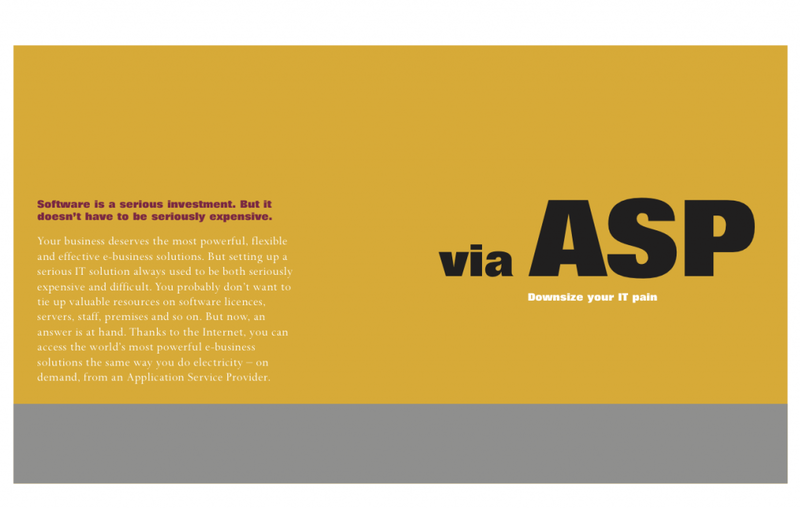 These mailers, postcards and mini-brochures were designed to promote a range of events being held by SAP to generate interest and awareness of their e-business offerings. The mailers were supported by sales letters and an email campaign. 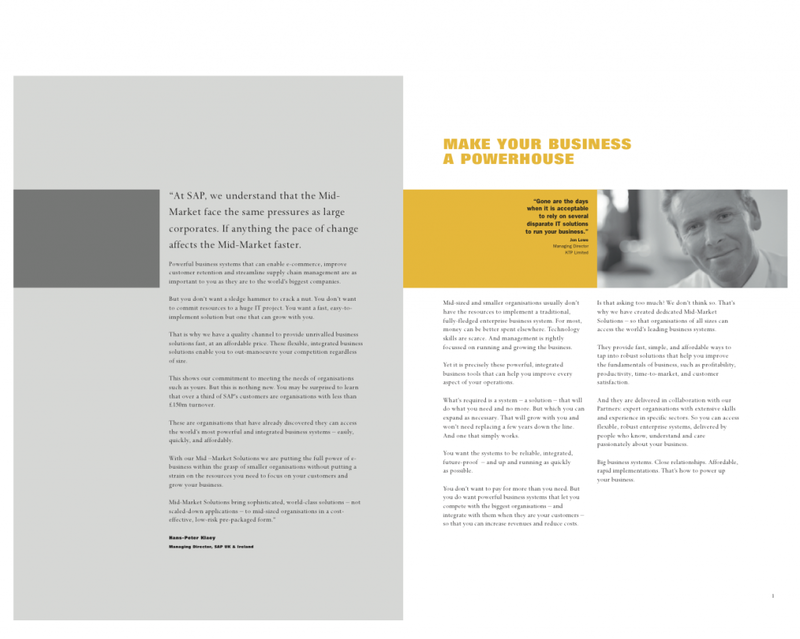 I also worked on a range of complementary brochures and mailers targeting different sectors – such as medium-sized businesses; as well as different individuals involved in the decision-making process, such as IT departments and senior management. The result was a range of marketing collateral which contained a strong emphasis on business benefits with clear explanations of the technologies and concepts involved, all of it written in jargon-free English tailored to the interests and expertise of the target audience.